The Eighties…what a great, fertile, inventive time that was for horror. When the major studios discovered back in the late Seventies that indie horror flicks were cheap to make or just buy outright and distribute, they started crankin’ ’em out…by the DOZENS. Way back when, THE EXORCIST turned the faucet on. The movies that would launch long-term franchises filled the tub. HALLOWEEN. Friday THE 13th. A NIGHTMARE ON ELM STREET. And then the tub started spilling over. CHILD’S PLAY. THE HITCHER. THE LOST BOYS. NEAR DARK. FRIGHT NIGHT. Every company, great and small, started looking for the next EXORCIST, ALIEN, JAWS…the next big thing that would make millions. Enter Vestron Video. Vestron had started out doing some of the first direct-to-video pictures ever made, discovering that the market was HUGE. So big, in fact, that they started a movie division, Vestron Pictures. Their strategy was simple: make good (if not great) genre pics that would put asses in the seats, that they could then distribute through the video arm later on. 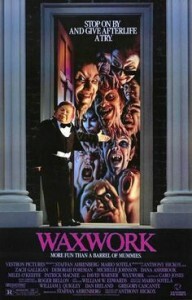 One of Vestron Pictures’ first releases was a little number called WAXWORK. The plot of the old horror classic MYSTERY IN THE WAX MUSEUM was such a tried and true staple, the studios kept falling back on it again and again, finding fresh ways to retell the story. WAXWORK took a little different approach from the straight-ahead versions, with a cast and a sensibility for horror that still screams “Me Decade” even today. Check out the victim’s list: Zach Galligan (GREMLINS.) Michelle Johnson (BLAME IT ON RIO.) Deborah Foreman (VALLEY GIRL). Dana Ashbrook (TWIN PEAKS). Miles O’ Keefe (TARZAN THE APE MAN). Then you throw in vets like David Warner, Patrick McNee, J. Kenneth Campbell, John Rhys-Davies, tap Bob Keen (HELLRAISER) to do make up effects, and you have yourself an Eighties’ classic! Like most films of the period, it starts off with a group of bored, young slacker-types looking for thrills, something…ANYTHING that would be a little more exciting than getting high, getting drunk, getting laid (well, ALMOST more exciting than that), and definitely more of a kick than going to college classes! Well, okay, they DO draw you in. Here’s the kicker: the displays are dedicated to some of the most well-known figures in the history of horror: Dracula. The Wolfman. The Mummy. The Marquis de Sade. Reenactments of their most horrible deeds as they drained blood, hacked and tore off limbs or crushed their helpless victims to death. Seeing the scenes gives patrons the feeling of being in the moment…but if they give in to the compulsion of stepping across the velvet rope around each display, they will find themselves living in that moment…FOR REAL. And here’s the REALLY bad news…if the monsters in each display kill you in the ‘waxwork dimension’, you become a permanent part of the display…FOREVER. So once that happens, the situation couldn’t get worse…could it? Oh, yeah! The proprietor of the museum has a darker agenda than just dispatching troublesome teens, as our heroes and victims discover with each person who ‘disappears’ into the museum. And seeing how that plan gets foiled is only part of the giggly, gory fun. Remember that I mentioned that Bob Keen was the effects guy on this? He got his start as a modeler for movies like STAR WARS, SUPERMAN and ALIEN, cutting his teeth as he worked up to projects like HELLRAISER and THE UNHOLY. But he really served up his calling card with HELLRAISER and with this movie. Gore-wise, this is where the retelling of the Wax Museum story gets more interesting…because thanks to Bob, the visuals go where they never had before. In a manner that would’ve made the suits at Universal flinch back in the Thirties, Keen and writer/director Anthony Hickox do away with the “quaint violence” that Famous Monsters used to wreak upon their poor victims. No camera pull-aways here, folks. Where somebody might only threaten to “rip off your head and crap down your neck”, these boogeymen take that threat to its most intense extremes. No CGI fakery, either. This was back-in-the-day where almost all the effects were practical, live and in-ya-face…the way we like it! Okay, so the clothes, the music, the casting and even the acting squarely establish this as what could be considered a “period piece” for horror, I guess. But like his colleagues David Schmoeller, Ted Nicolaou, Stuart Gordon and on occasion Charles Band himself, Hickox knows how to get the action going and keep it that way. This is one of those gems that might’ve slipped under your radar, but definitely worth seeking out, hunting down and dragging back home to mount in your DVD library.